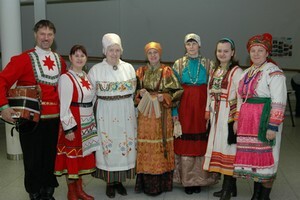 The Finno-Ugric peoples are part of a unique family of human cultures possessing languages, cultural and artistic traditions that form a distinctive and irreplaceable part of the beautiful tapestry of humanity. The linguistic kinship of the Finno-Ugric peoples was discovered by a Hungarian Catholic priest, János Sajnovics (1733-1785). Today, the Finno-Ugrics are known to be part of a larger family, the Uralic languages which includes also the Samoyedic peoples: the Nenets, Enets, Nganasans and Selkups. According to the Russian Federation's 2002 census, 2 650 402 people identified themselves as Finno-Ugric. However, experience shows that in all probability a large number of ethnic Finno-Ugrics, possibly even half, would likely have chosen to identify themselves simply as Russian. Therefore, in all probability, the real number of Finno-Ugrics in the Russian Federation is 5 million or more. When we add Estonians, Finns, Hungarians and Saamis, the world population of Finno-Ugrics exceeds 26 million! That means, there are nearly as many Finno-Ugrics as there are citizens of Canada! The original home of the Finno-Ugric peoples is generally believed to be west of the Ural Mountains, in the area of Udmurtia, Perm, Mordva and Mari-El. By 3000 BC, the Baltic-Finnic groups had migrated west to the shores of the Baltic Sea. At about the same time, the Saami migrated further north and further west, reaching the shores of the Atlantic Ocean. The Magyars (known as Hungarians in English) made the longest and most recent journey from the area of the Ural Mountains to their present home in central Europe only in AD 896. 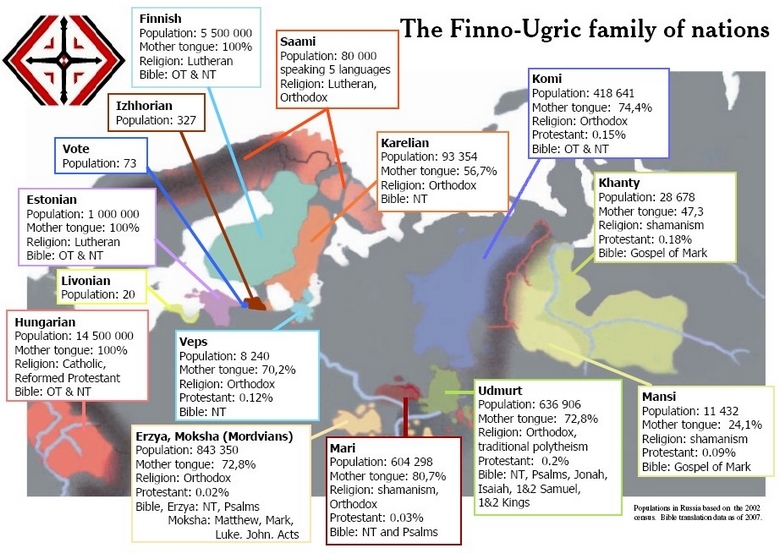 How old are the Finno-Ugric peoples? The "Comb Ceramic Culture" (so named due to the comb like tool used to give artistic decoration to their pottery), which flourished between the Urals and the Baltic Sea between 4200 and 2000 BC, is generally presented as the oldest clear evidence for early Finno-Ugric communities. This identification of the Comb Ceramic Culture is based in part upon discoveries of skeletal remains which share the Finno-Ugric distinctive mixture of caucasian and mongoloid features. But does the Finno-Ugric Comb Ceramic Culture represent the start or arrival of the Finno-Ugric people, or does the distinctive comb pattern simply show a new artistic tradition among an already old Finno-Ugric civilization? Archaeologists are currently unable to answer that question. While archaeologists have discovered human settlements in this region going back to before the end of the last ice age, there is currently no evidence to identify these earlier settlements with the Finno-Ugrics or with any other known culture. Since two or more ethnic groups may live in the same area, the geography itself is not sufficient to prove a relationship. In order to positively identify these earlier settlements, it would be necessary to show some kind of connection, for example, similar artistic traditions that show a common culture. Unfortunately, as these earlier settlements are 10 000 years old, there simply is not enough surviving evidence to make this kind of a link, leaving their identity a mystery. How old are the Finno-Ugric peoples? Currently it is impossible to give an exact answer. The best we can say, is that the Finno-Ugric peoples originated west of the Urals sometime between the end of the last ice age in 8000 BC and 4200 BC. writing was invented by the Sumerians in about 3800 BC. the Turks began their migration to Turkey in about AD 600. As a result, anthropologists have referred to the Finno-Ugric peoples as being among the oldest permanently settled people groups in Europe, and the oldest surviving residents of north-eastern Europe. It is, however, no longer possible to separate the history of the Finno-Ugric peoples from the history of a different people group, the Indo-European Slavs. By AD 600, the Slavs had divided into southern, western and eastern branches and began a slow process of migration and expansion. In the 9th century, the Eastern Slavs developed their power centres of Kievan Rus and Novgorod. By the mid 16th century, with the Russian conquest of the Khanate of Kazan, virtually all Finno-Ugric group, not counting the Sami, Finns, Estonians and Hungarians, were under Russian control. Today, most Finno-Ugric people groups live within Russian Federation, their future being forever linked to that of their large Slavic neighbour. Estonian philologist Mall Hellam has discovered only one sentence that is almost mutually intelligible in the three largest Finno-Ugric languages, Hungarian, Finnish and Estonian: "The living fish swims under water." To this can be added Erzya "Эрцця калосо укщны ведь алга"
Kemi Saami - Extinct as of 19th. cent. Numbers for people groups in Russia taken from the 2002 Census of the Russian Federation. As with any family, members will have a closer resemblance with some and a more distant resemblance with others. But it is the common roots of our language that identify us as a family, and form the foundation for exploring similar cultural, artistic and philosophical connections.